Because I think that CMC values are over-rated (who's interested in the behaviour of pure surfactants in pure water? ), I felt no need to provide a list of CMC values. But people said that such a list would be useful, so here it is. My colleague Dr Hiroshi Yamamoto shows on his Pirika cmc pages how it is possible to correlate cmc values with surfactant structure along homologous series. As a reminder, the Critical Micelle Concentration is the concentration at which the surfactant molecules start to assemble into clusters as shown in this image from Hiroshi's site. Hiroshi kindly gave me the dataset he had assembled from various sources and I've added a few values of general interest. 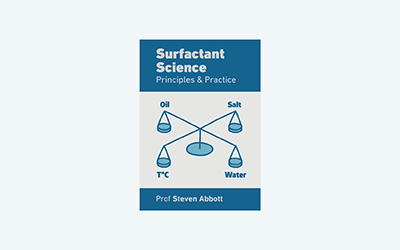 Given that many of these values are for scientifically pure surfactants and that most of us use industrial grade surfactants, the numbers should be treated as illustrative only. In addition the values depend on temperature and salinity which for this table can be assumed to be 25° and "low" respectively. Broadly speaking the data show that for ionics the head group doesn't make a big difference and that the cmc decreases steadily (in a log fashion) for longer chain lengths and that cmc is simply estimated via molar volume. Ethoxylates follow a similar trend but the EO head is not very hydrophilic so the cmc for a given alkyl chain is much lower. Hiroshi's site explains all this in detail, and also shows that fluorosurfactants (not included in this table) follow the same trend - it is molar volume (and the F atoms are much bigger so cmc is much smaller) not molecular weight that is important.